Omega representing the last letter of the Greek alphabet bookends the theme started with Alpha (The first letter of the Greek Alphabet) allowing the runner to have an economical AI option on the last piece of ice on every server. By-pass: Inside Job has quite a bit of synergy with Omega making it much more likely for the runner to actually reach that last piece of ice where Omega can do it's work. Similarly DDoS could potentially have the same effect on a server where outermost ice is unrezzed. 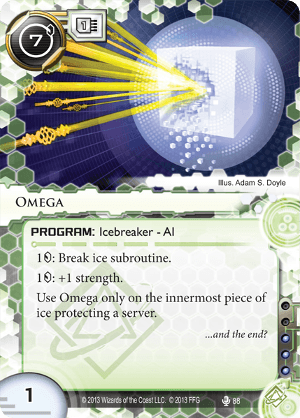 Keep server on thin ice: So long as key servers are thinly defended Omega can continue to be a reliable AI ice breaker. Forked, Knifed, Spooned & Parasite can certainly be used to remove layers of ice, additionally Forged Activation Orders, perhaps after Account Siphon or Emergency Shutdown to make the corp poor can also effectively remove yet more layers of ice. Early game access: With Omega out early, the corp faces the difficulty of having to create 2 layers of ice on each server (possibly both layers needing End the run's) before having any meaningful measure of security. Cheaper ice-breaking: Particularly when facing sentry ice, Omega can provide a more cost effecting breaking compared to many killer sub-type ice breakers. Anti-AI: Swordsman & Turing both represent hard counters to an AI-only ice breaker strategy. Since Omega has only 1 base strength, Wraparound or any other uber-high strength ice could be rather taxing or even potentially price a runner out of a server. Cost: At 7, Omega's cost is right up there with other heavy-hitters which given it's limited scope could make that cost a bit more difficult to swallow. Omega is one of the least popular AI ice breakers, still perhaps in combo with Rielle "Kit" Peddler: Transhuman & Paintbrush, ice-trashing programs etc it has a viable nieche that favors aggressive play-style.